President Donald Trump said Monday after speaking with Saudi Arabia's King Salman that "rogue killers" may be responsible for the mysterious disappearance of Washington Post journalist Jamal Khashoggi. ″I just spoke with the King of Saudi Arabia who denies any knowledge of what took place with regard to, as he said, his 'Saudi Arabian citizen,'" Trump told reporters on the White House lawn. "He firmly denied that." Trump added: "Maybe these could have been rogue killers. Who knows?" Trump tweeted earlier that he'll be "immediately sending" Secretary of State Mike Pompeo to meet with King Salman. "Just spoke to the King of Saudi Arabia who denies any knowledge of whatever may have happened 'to our Saudi Arabian citizen,'" Trump wrote in the tweet. "He said that they are working closely with Turkey to find answer. I am immediately sending our Secretary of State to meet with King!" Trump told reporters that Pompeo was leaving "within an hour." Since his disappearance, U.S. intelligence intercepts revealed that Saudi Crown Prince Mohammed bin Salmanordered an effort to lure Khashoggi back to his home country, The Washington Post reported last week, citing to U.S. officials familiar with them. 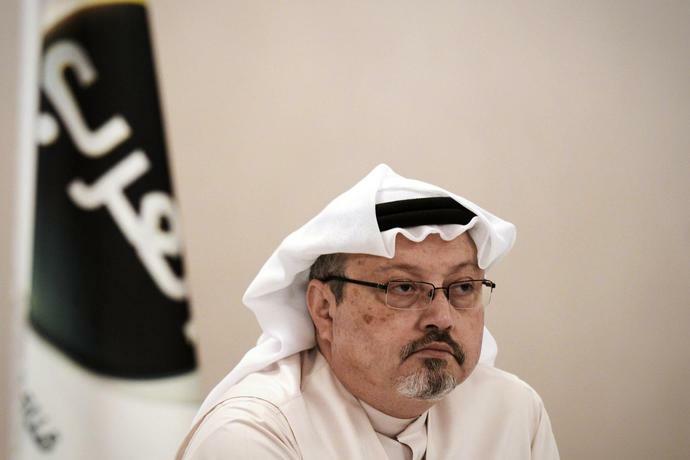 Turkish officials also revealed that they have audio and video proving Khashoggi was murdered at the consulate. Trump said last week he'd speak with King Salman "very soon" and wouldn't halt U.S. arms sales to Saudi Arabia despite the suspicions. Trump told CBS' "60 Minutes" on Sunday that the consequences of Saudi involvement in foul play involving the journalist would be "severe." He added: "As of this moment, they deny it and they deny it vehemently. Could it be them? Yes." On Friday, when asked about Khashoggi's disappearance on "Fox & Friends," Trump said, "I don't like it at all." "Now, you don't have American citizens, but that, in this case, doesn't matter. I don't like it. I don't like it with respect to reporters. It is a terrible, terrible precedent. We can't let it happen," Trump said. Later that day, Trump told reporters at the White House that he wasn't open to stopping arms sales to Saudi Arabia because "this took place in Turkey and to the best of our knowledge, Khashoggi is not a United States citizen." "I don't like stopping massive amounts of money coming into our country," the president said. "I don't like stopping an investment of $110 billion in the United States." Trump pointedly didn't use Khashoggi's name in his tweet Monday. His reference to Khashoggi via King Salman's quote ― "our Saudi Arabian citizen" ― appears to emphasize that Khashoggi is not a U.S. citizen.